Introducing Yooka-Laylee, from the popular 3D platformer by Playtonic Games. 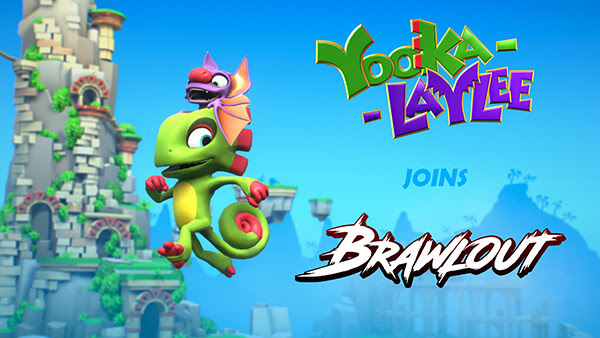 The buddy-duo, Yooka (the green one) and Laylee (the wisecracking bat with the red nose) join the brawl complete with the moveset learned in their epic adventures! Lizard Leap your foes into the air, bring them crashing back down to earth with a Buddy Slam and send them soaring with a Sonar 'Splosion! Yooka can even slurp up an incoming projectile to use it as his own! I didn&apos;t play Yooka Laylee and I don&apos;t play Brawlout very much but that&apos;s pretty cool. They really need more stuff like this because the package is a little lacking. If it had Shovel Knight or a few more interesting characters it would be a lot more popular. I mean, personally to me it&apos;s not like the Citizen Kane of platformers or anything but it&apos;s playable and has its charm and that&apos;s more than enough for me to find enjoyment in there. Yeah, I was just playing around here. I liked Yooka-Laylee well enough to complete it and have a good time. Truth is I probably wouldn&apos;t have played it after all the hate if I wasn&apos;t sent my backer code, but I&apos;m glad I did.